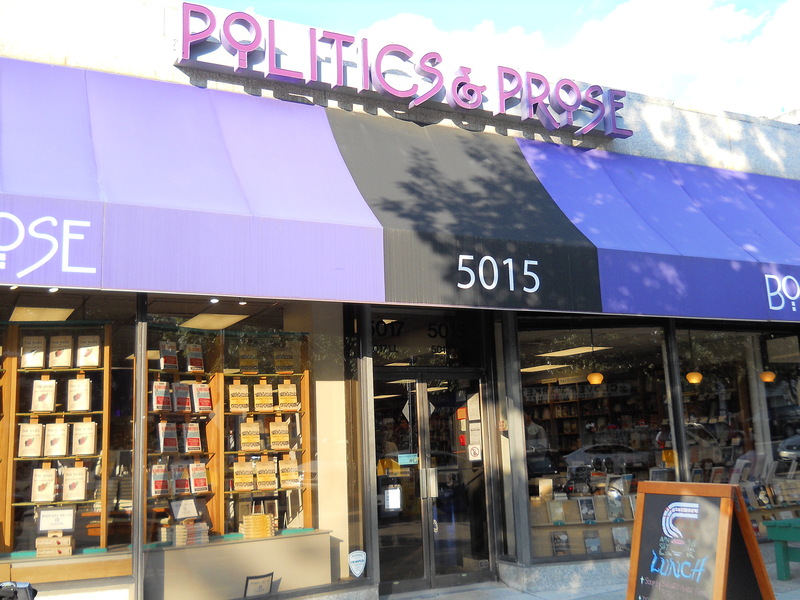 Politics and Prose Bookstore in Washington DC is one of the best independent bookstores I’ve ever seen. It had three characteristics that, for me, make a bookstore rock. The inside is well laid out, with a unique look that makes it different from the chain stores and specific to the architecture of the store and space. I love it when the store has its own look and character. 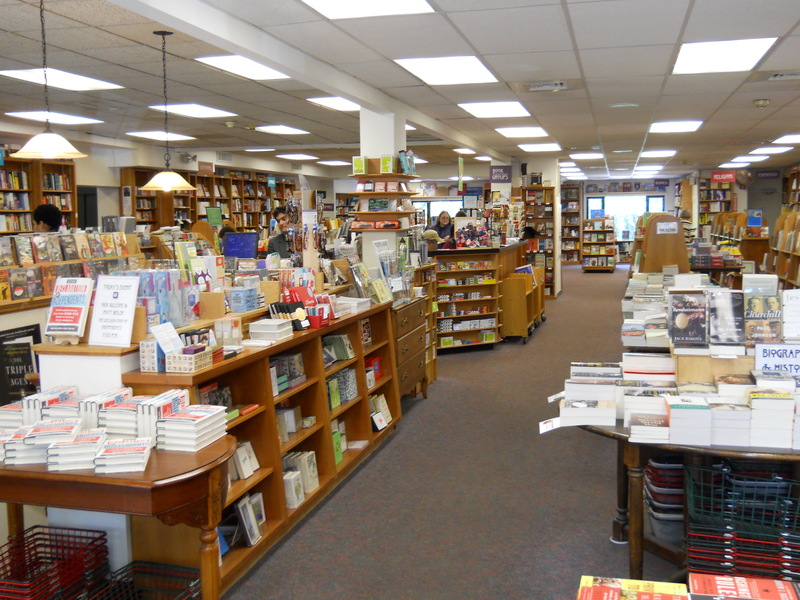 The three Tattered Cover Bookstores in Denver each utilize their space so well, some with hidden rooms and desk space, others with wide open space and a good use of floor displays and tables. P&P has books everywhere but doesn’t feel crowded. The books are well-organized. The shelves are neat. There is a coffee shop downstairs along with another room with a long table for important life or death meetings, book club events, or reading. The YA section is well stocked and clearly laid out. There’s a space upstairs for readings with folding chairs and a podium. This place is great. Did I mention the purple awning over the front and the purple lettering? The staff is friendly, helpful, and knowledgable about their subject areas. I came twice to the store, walking the fifteen minutes from the metro in 100 degree heat. I was soaked each time. The first time the people I needed to see weren’t there – I missed them by a couple of hours, ugh – the staff at the front desk took down all the pertinent information and promised to pass it on to the individuals I needed to see and helped me to make an appointment for the next day. When I returned I spoke to Heide the children’s book section manager. She took twenty minutes out of her day to listen to my pitch about Open Wounds, asked questions, and really seemed enthusiastic about the book. Mostly what I liked was the attention she paid to what I said. She was present and interested. I then heard one of her staff Silas, talking to a customer about fantasy novels and he really seemed to know what he was talking about. When he finished with them I asked him for some suggestions for my son, Max, who loves fantasy novels. I gave him the lowdown on what he’d read, his age, and what he liked so far and without blinking he pulled out from three different sections of the shelves books I’d never heard of or seen before. Max has read one of the books and loved it,while I’ve started another… This guy knows his stuff. The place has to have a certain feeling to it – like I’ll want to stay there, hang out, and look at books all day. Maybe 1 and 2 above lead into three. I don’t know – but this quality a book store either has or doesn’t. P&P does. We’re stopping by again on our way down south in August. You can bet on it. This entry was posted on July 22, 2011 by Joe Lunievicz. It was filed under Blog, Events, Travel .